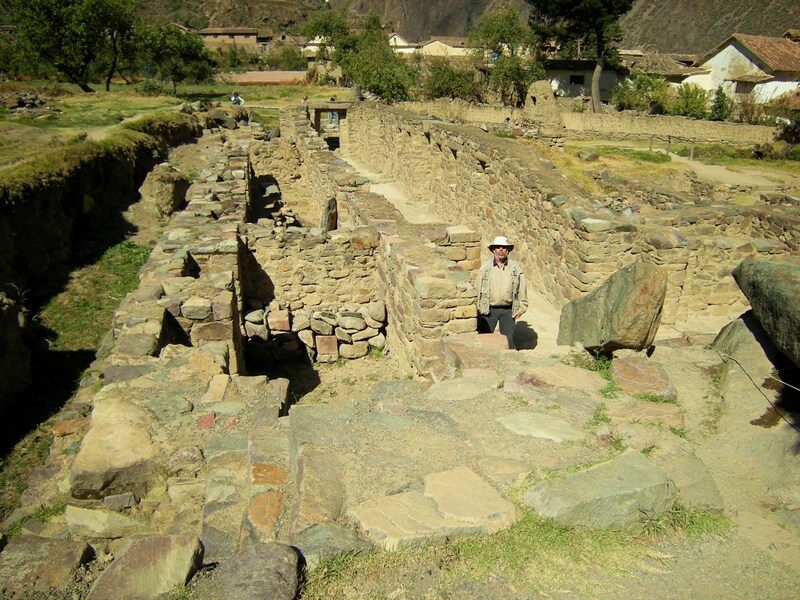 Our next stop was a visit to the village and ruins of Ollantaytambo, where the Inca king Pachacutec built his fortress. 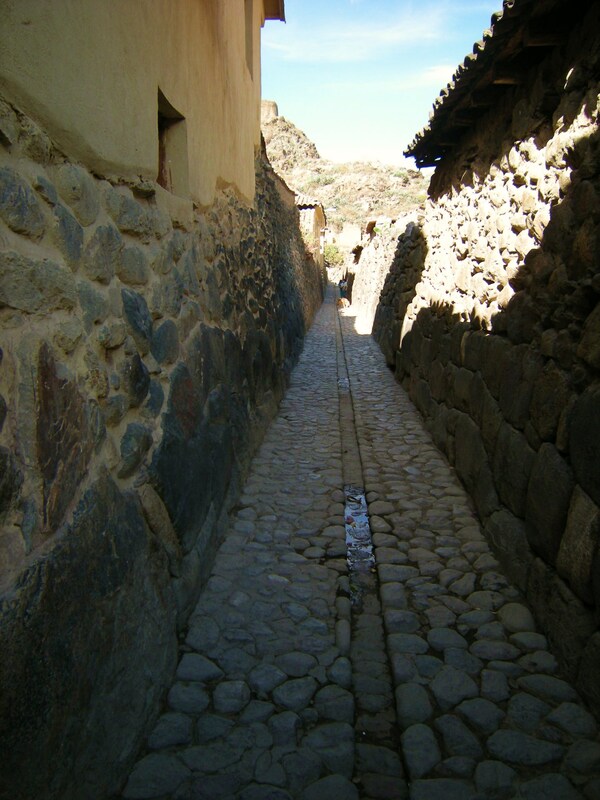 This village has been consistently Quechua/Inca, as it was never captured by the Spanish. 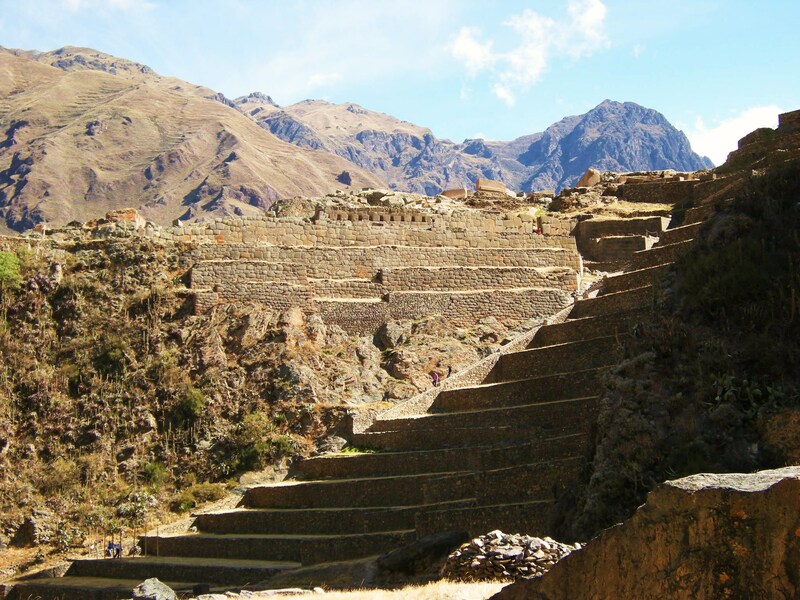 Myth has it that the town’s name comes from an Inca captain, Ollanta, who fell in love with Pachacutec’s daughter. 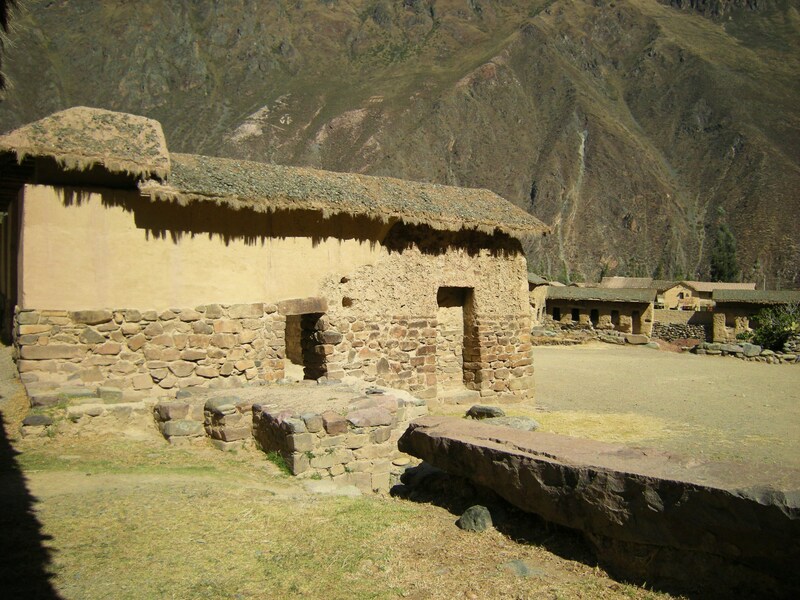 Pachacutec forbade them from marrying, and Ollanta rebelled. Pachacutec was killed in the battle that followed and Ollanta almost defeated the army of the empire, but was betrayed. The new Inca king took pity on him because he was a great warrior, so he allowed Ollanta to marry the princess after all. 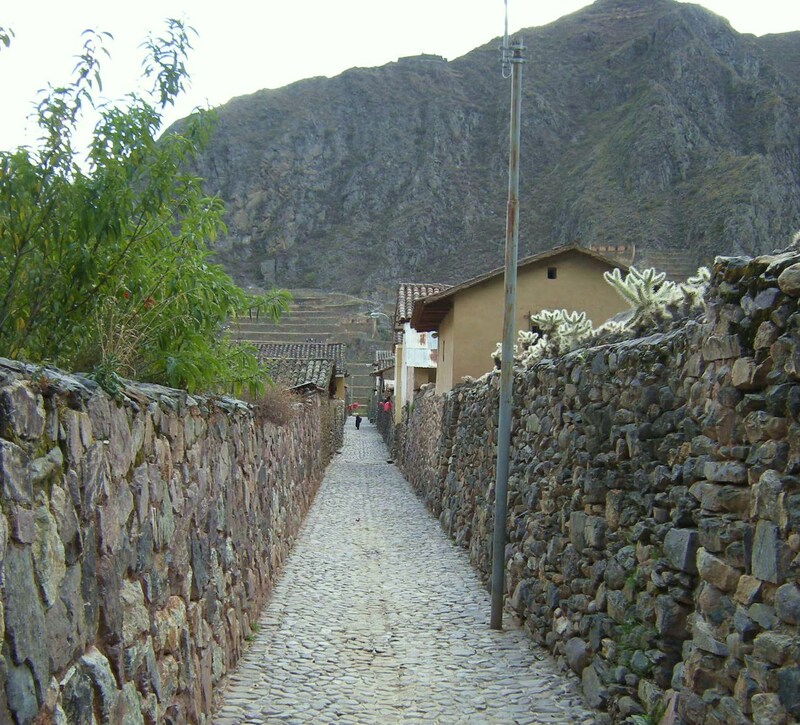 Ollantaytambo was the site of the greatest victory for the Inca over the invading Spanish forces. 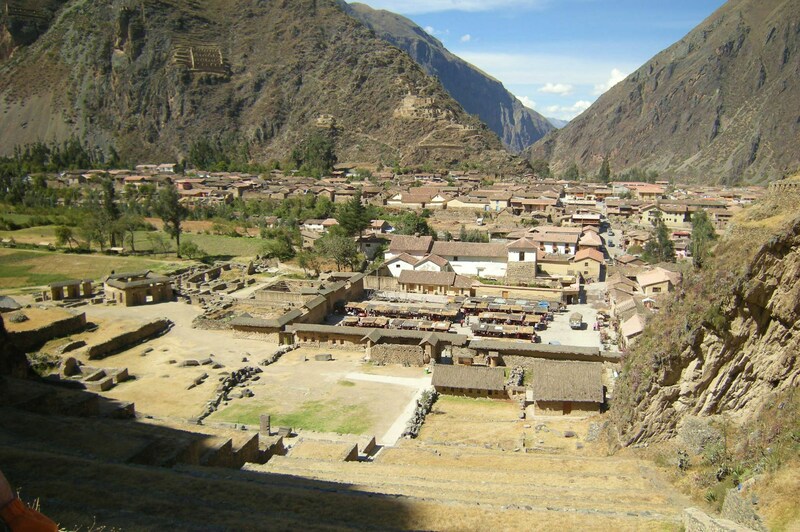 Ollantaytambo was the rebel headquarters for the last of the Inca rulers, Manco Inca Yupanqui. When the Spanish arrived at sunrise, Manco was mounted on a horse on the highest terrace, and at his command, spears, stones and arrows rained down on the invading forces. On a steep mountain across from the main ruin and town can be plainly seen a structure built into the hillside containing a series of short walls. 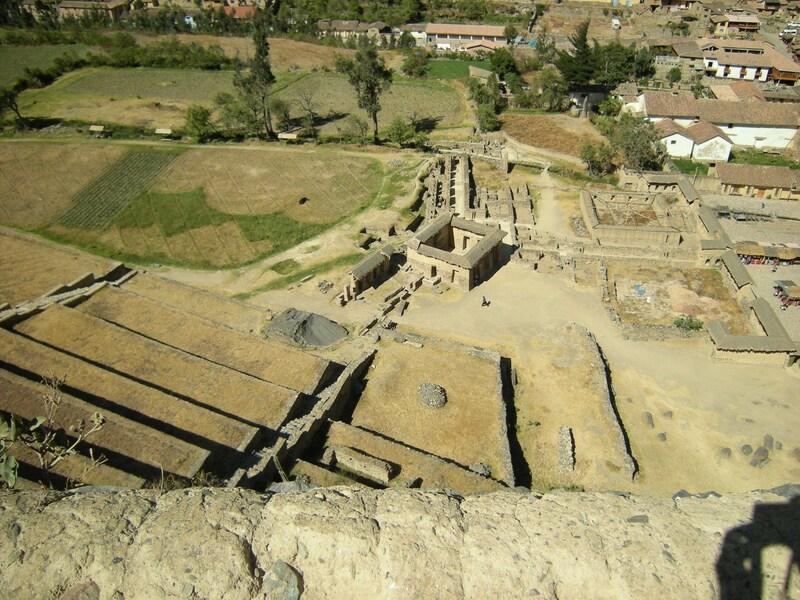 These were granaries (colcas), where the Incas warehoused their supplies of grain and potatoes to be distributed as needed among the community. Originally they would have had thatched roofs protecting the warehoused goods. 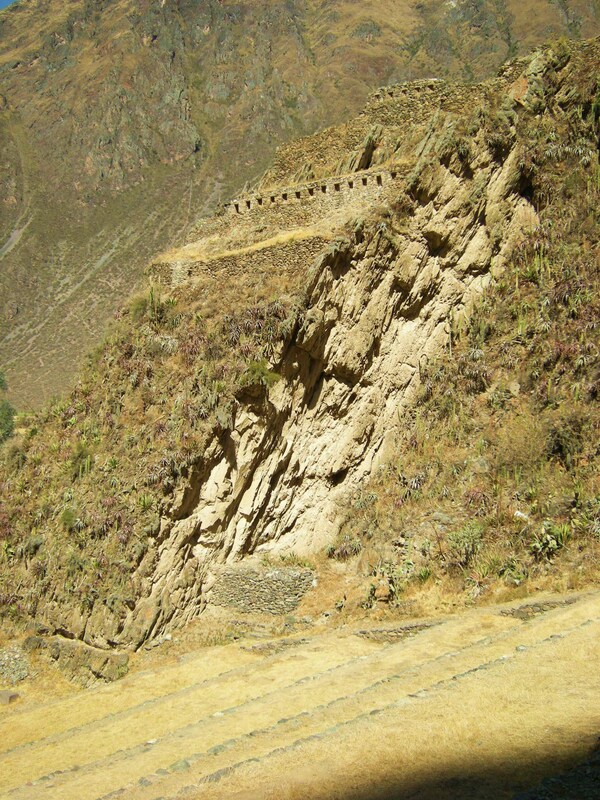 Seventeen steep terraces lead up to the fortress and walls rise from the almost vertical cliffs, “protecting the strategiec entrance to the lower Urubamba Valley.” The steep terraces provided protection for the temple at the top. It’s easy to see why the Spanish never captured this place. There are 263 steps to climb to the top! We took it slowly, stopping often to catch our breath and a swig of water. 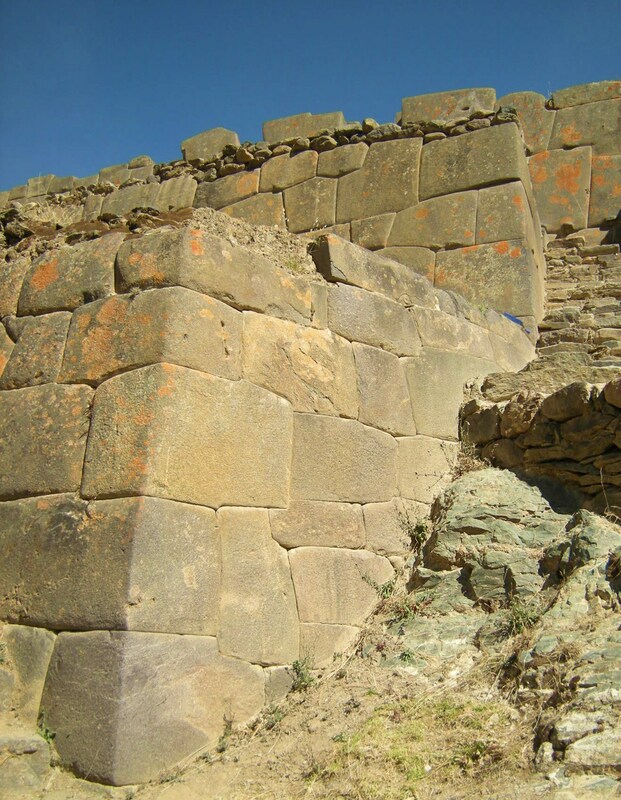 Boris explained that the stones used to build this fortress were brought from a quarry on the other side of the Urubamba River. It must have taken thousands of workers to move these enormous granite slabs, using inclined planes and rolling logs. Some of the carved and polished stones never made it to their destined spot, and at the time of the conquest, construction was still incomplete. These unused stones can be seen scattered about at the bottom of the ruins. 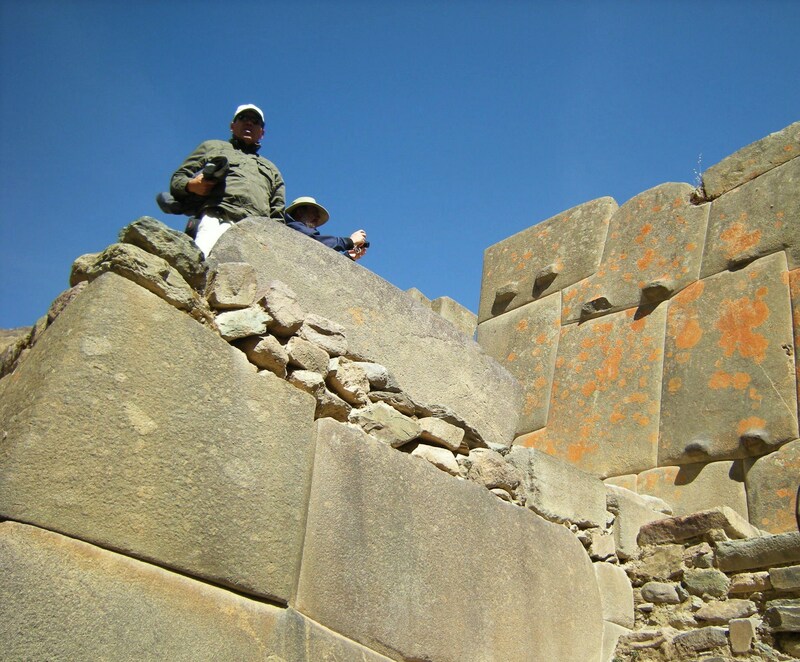 Once we had reached the top, Boris pointed out examples of the famous polygonal stonework of the Incas. Each beveled stone fits perfectly and tightly against the others surrounding it, like a jigsaw puzzle, without the use of mortar. 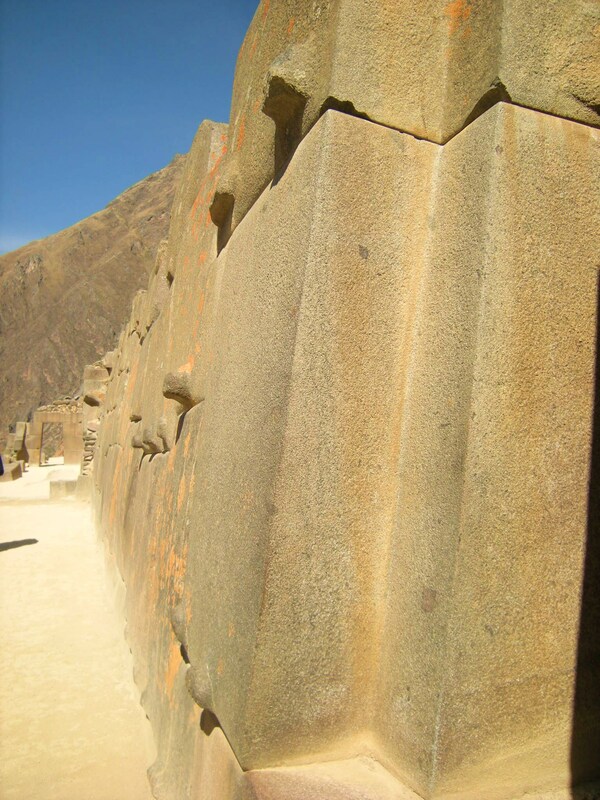 The Incas reserved this type of stonework for their more sacred and important buildings, and these buildings and walls have withstood weather and earthquakes throughout the centuries. 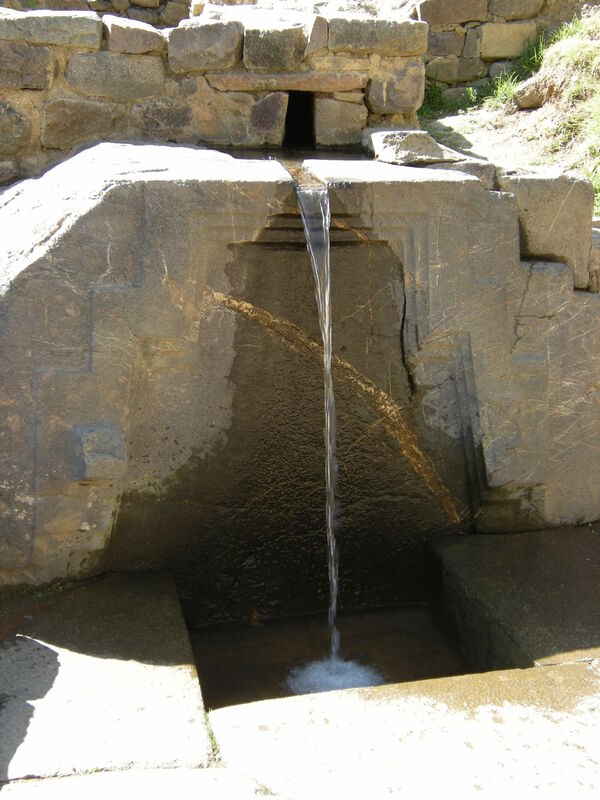 Carved on many of the stones are protrusions which have various meanings. Part of it was simply aesthetic. The shadows cast by the protrusions serve as miniature sundials, marking the time of the day. 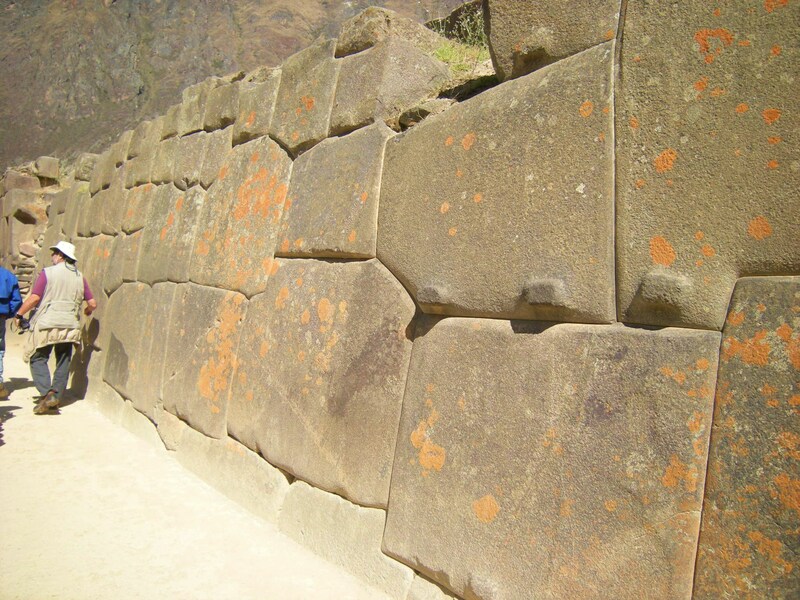 Also, the number of protrusions carved on each stone had significance. Each number had its own meaning; one protrusion represented the male while two represented the female. 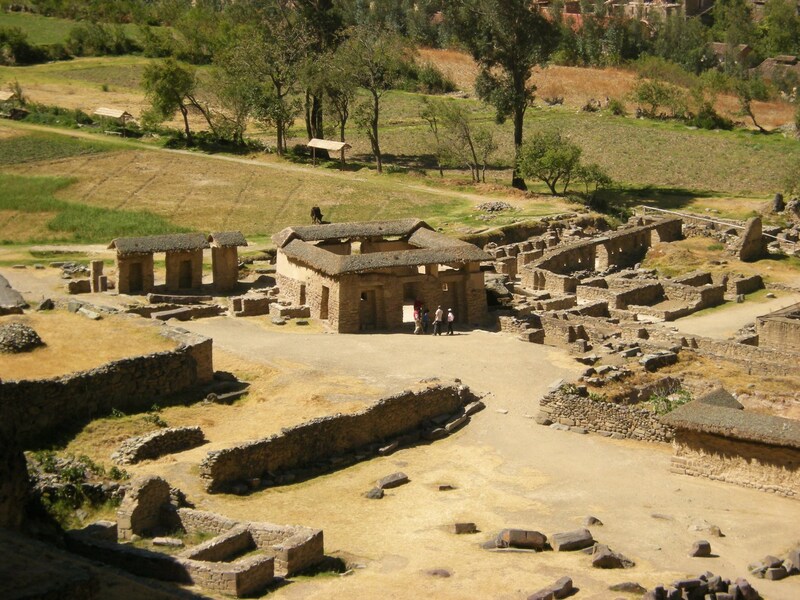 In the center of this high, sacred area, is a partly destroyed structure which was the Temple of the Sun. Other temples were built around the central one. Some energetic members of our group hiked to another even farther up section of the ruins, probably a residential area. 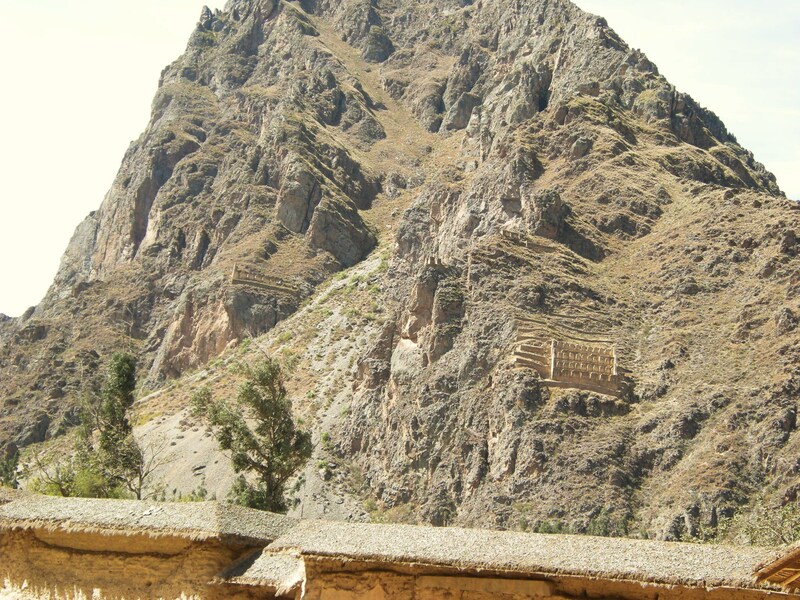 Also notable in Ollantaytambo and elsewhere is how the Incas built their structures around the mountains and hills, respecting their natural shape. 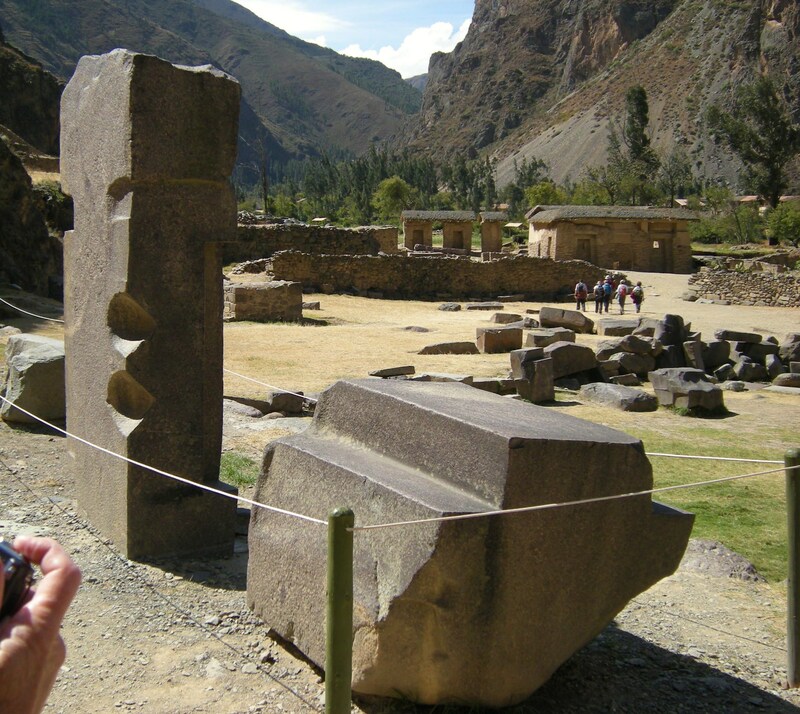 Indeed, mountains and natural rock formations were themselves sacred to the Incas. I had forgotten my hat, in my confusion about all the things we needed to bring today, and I paid for it dearly later. Although it is winter and the temperatures are not hot – probably the 60s in the sun – the sun is still very hot, especially at this altitude. 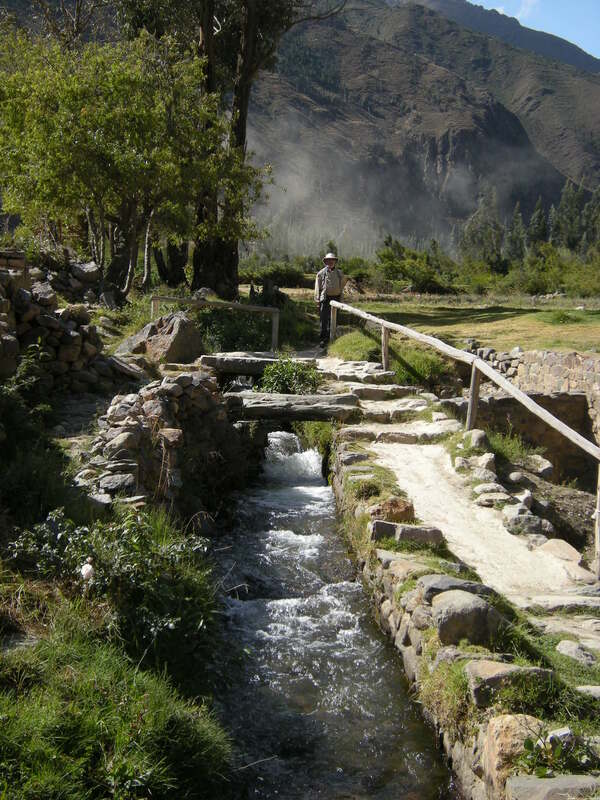 Many Peruvians, especially those in rural areas, wear hats on a daily basis. 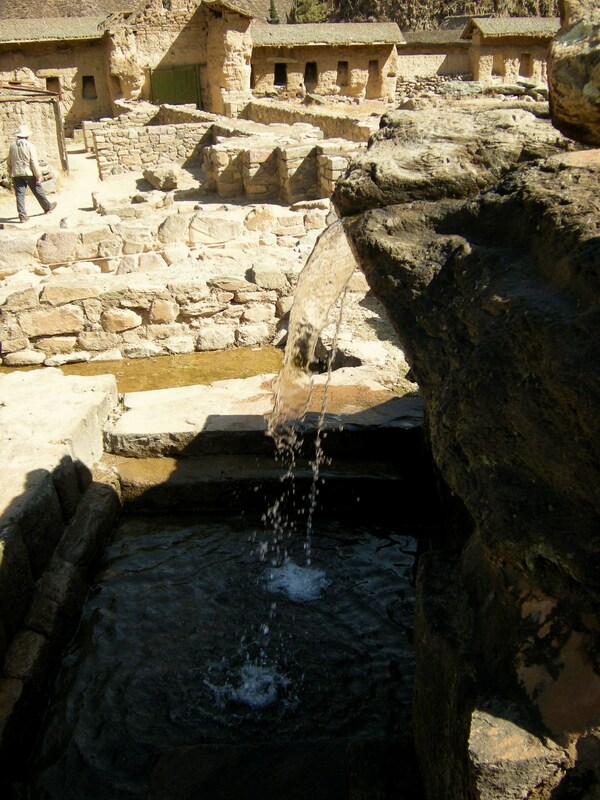 When we descended the stairs again, Dale and I went exploring at ground level, where there were a series of fountains fed by still functioning aqueducts. This area appeared to also contain dwellings, evidenced by the pirka stonework and series of small rooms. 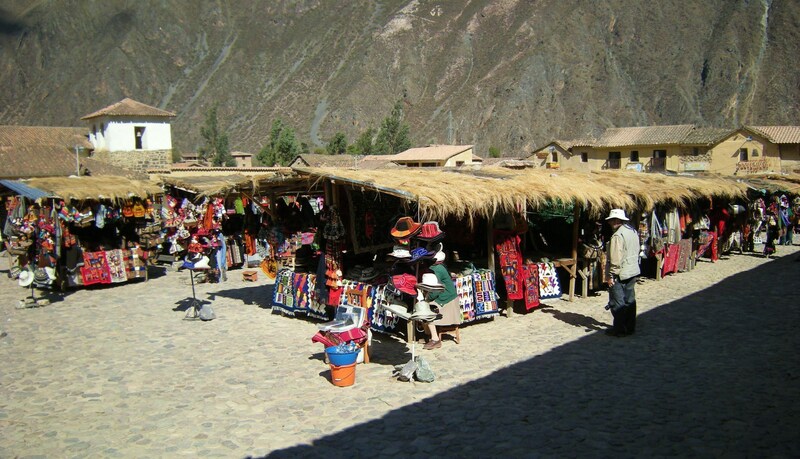 Nearby is a church and beyond that the handicrafts market, of substantial size. This market caters to the tourists, of course, but I found it more interesting and unique than most of what we’d seen so far. Actually, at this point I was seeking shade. I stepped into the cool of some permanent shops at the far end of the market. Boris was waiting in one of them, a small café that he said served very good coffee and hot chocolate. It was tempting, but I was in the mood to buy something. Next door was a shop with a lot of interesting jewelry. The young woman there told me she and her husband made the jewelry. 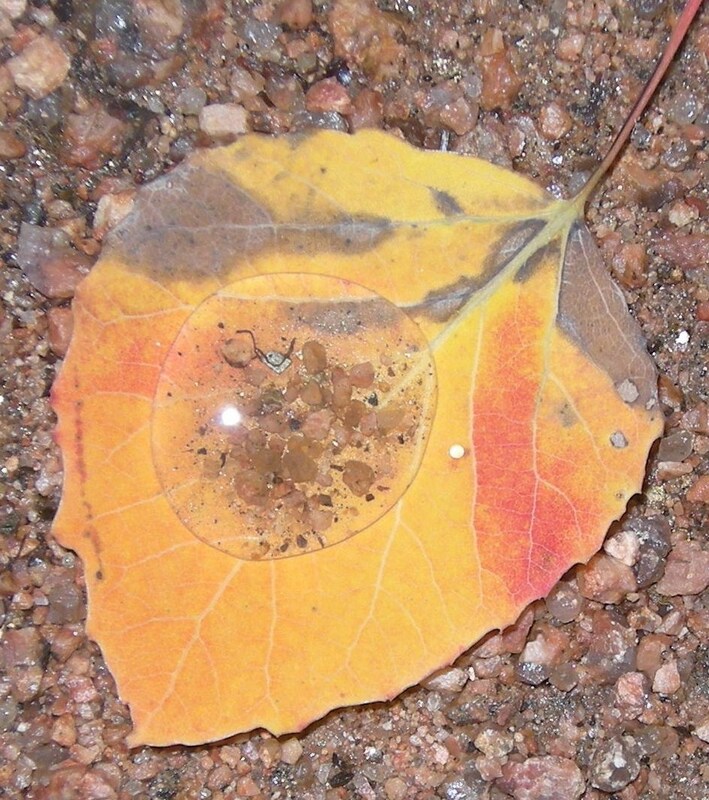 I admired a necklace in oranges, browns and blues which she said was made totally of shells, which they smoothed, shaped and polished. She showed me some matching earrings and I was hooked! The problem was the price: S/130, and I discovered that I only had about S/50. She couldn’t take a credit card, so I said sorry and left regretfully. I went back next door and casually mentioned it to Boris, who offered to lend me 100 soles! I promised to pay him back as soon as we could get to an ATM, so I joyfully returned with the money in my hand and purchased the necklace and earrings set. When everyone had gathered again, we set off to explore the town. 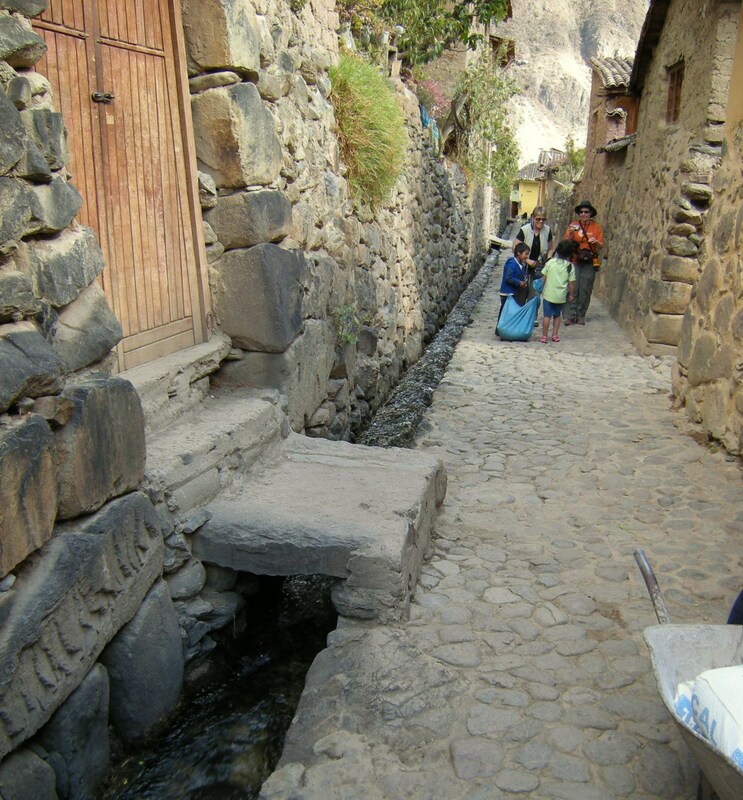 Many of the narrow cobblestone streets had ancient aqueducts running down the middle. There were no sidewalks per se, and when people came through with wheelbarrows loaded with bricks or wood, we had to stand up against the walls to allow them passage. Boris pointed out red flags on the ends of sticks protruding from some entryways. These red flags indicated a chicha bar that was open for business! Chicha is a maize beer, with low alcohol content, but which Peruvians drink in great quantities particularly when they are in a party mood. 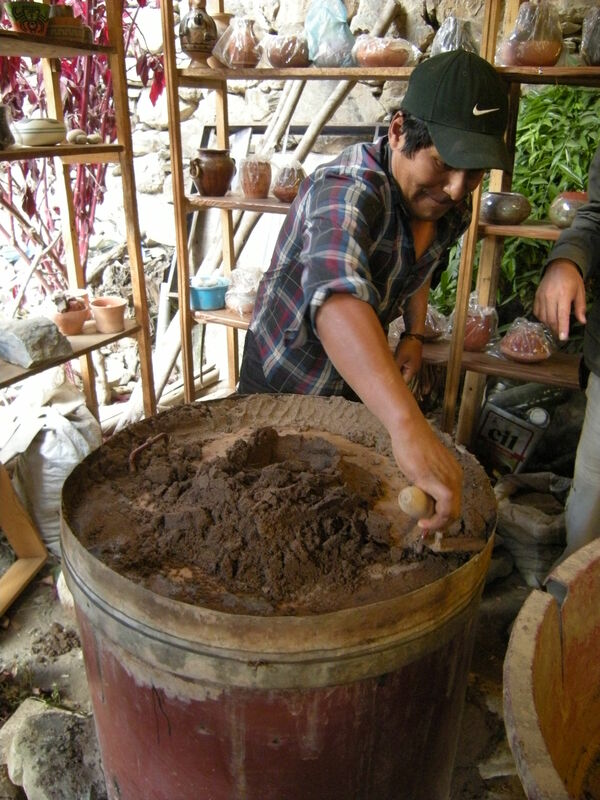 It is often prepared locally and when a batch has been fermented and processed, it is apparently ready to serve. Thus the flags. 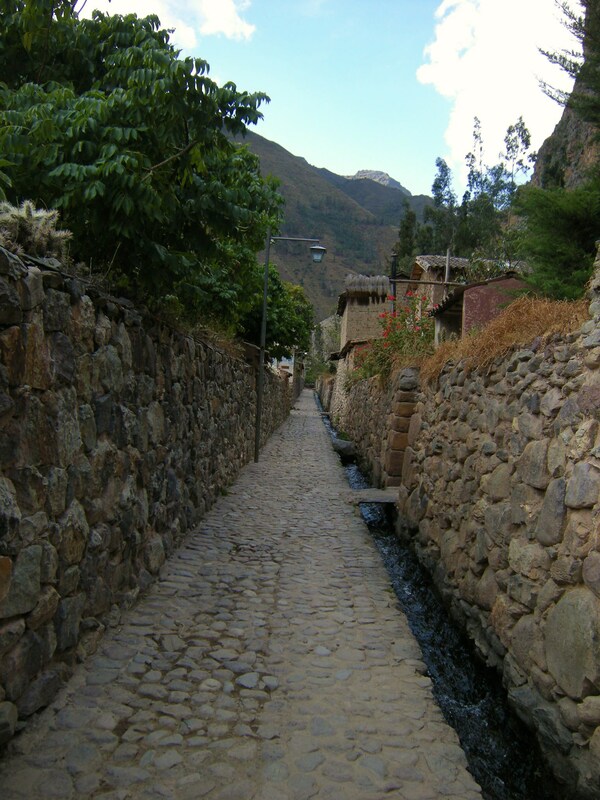 Note the red flags of the chicha bars at the end of this street. 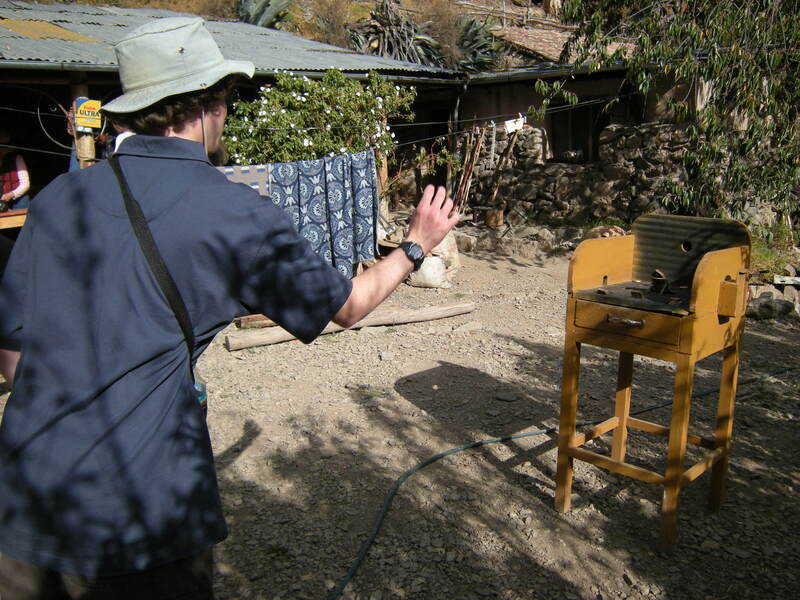 Our destination, however, was not a chicha bar, but rather the house and studio of a local potter. 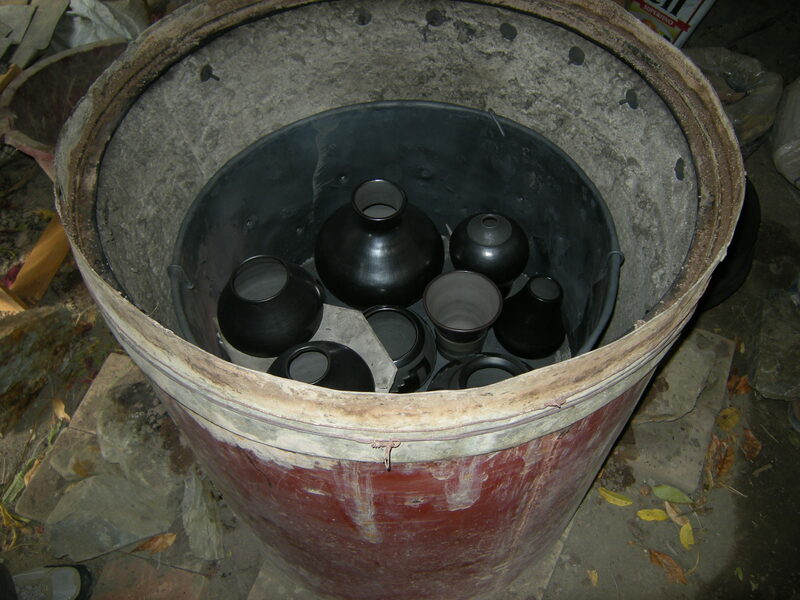 This potter had just finished firing a batch of black pottery in his kiln. He carefully cleaned the soil off the top and lifted it in order to show us the finished pieces. Other pieces were set on shelves around his work area, some covered in plastic bags. These covered pieces were the ones that were completely finished and ready for sale. I admired several pieces but didn’t want to take a risk of anything breaking in transit home – sending things by mail is very expensive. However, other members of our group picked out pieces they liked and bought them. I went out into the yard, where Dale and a couple of others were sitting on a bench. Jayme was playing a game called the Frog Game. This is a tavern game in which the player tosses flat round metal pieces from a certain distance, aiming for the frog’s mouth. 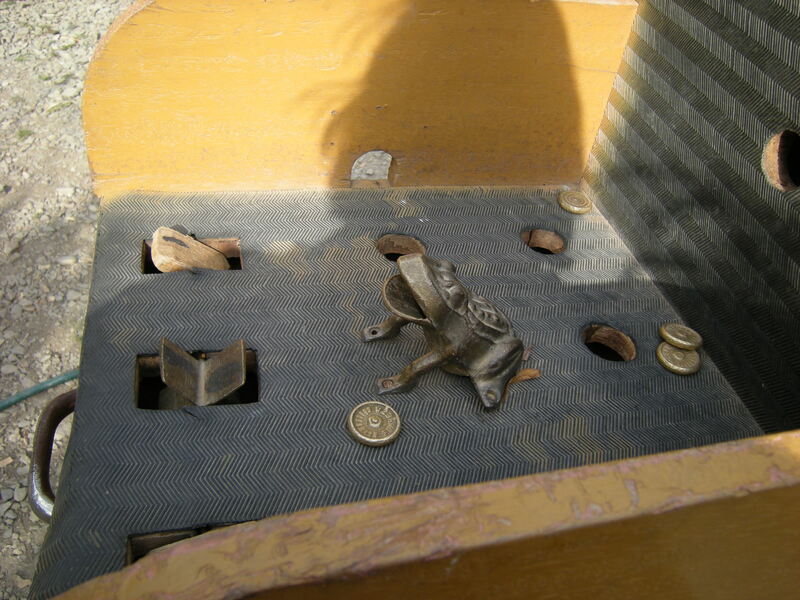 The wide-mouthed frog sits in the center and there are some other openings with partial obstructions to make it harder for the pieces to go in. If you get a piece into one of the openings, it falls down into a drawer, where the points are marked and counted. Too tired after our climb in the ruins of Ollantaytambo to have any interest in this game, I sat down on the bench next to Dale and waited for people to be finished. I was starting to feel a little queasy. Reblogged this on 1 Life – 196 Countries.